So I really, honestly have no idea what to say about this book. I could post another set of .gifs announcing how much fun I had reading this book. I could post a poster declaring the book hangover that hit me. But I've already done that when I sort of squee'd about the first book in this series. The thing is, though, that Crooked Kingdom was everything I wanted it to be... but at the same time NOT QUITE everything I wanted it to be. If that even makes any sense. I loved this book and I loved this duology as a whole. But if I had to be honest with myself, there certainly were some things in this conclusion that I didn't really like, as I figured there would be. Authors can't please everyone, right? And while certain events were pretty awesome, others, I felt either dragged a little or broke my heart. One thing is definitely for sure, though: I would definitely recommend this duology over The Grisha trilogy that was Leigh Bardugo's debut YA fantasy series. In comparison, overall, this one had a more thought-provoking story line, deeper and darker characters, with the same awesomely witty quips and humor that had been peppered throughout The Grisha trilogy. Bardugo is an excellent writer with excellent ideas and a knack for bringing her characters to life. And you'd think that it would be hard to handle so many characters, but all six of our heroes (or non-heroes, whatever you want to call them), were managed wonderfully. Crooked Kingdom brings forth much more of the meat of all our characters' histories while progressing them forward in present day. While Kaz, Inej, Matthias, and Nina were the forefront in the first book, this time around we get to see much more of Wylan and Jesper. I'm happy to get to find out more about these two boys who kind of sat in the background in the first book. And I overall loved what our author did for all six of these characters... well, except for one little snafu at the end of which I'm still not certain about how I feel (no spoilers), because it was unexpected and almost felt a little forced. Side tangent--there was one thing I noted a few times that stood out for me: At least three different instances, one character or another made mention of the fact that our six-person crew were no more than young teenagers--kids. Jesper's father is even brought into the mix, which really DOES emphasize the fact that Kaz and company are really all just kids. It made me wonder if Bardugo had included those instances on purpose for reasons. Because when I really think about it, sometimes while reading about the extraordinary things that these characters do throughout the book, you DO sometimes forget that they're really just a group of teenagers who have all been dropped into their hard times, and had to learn how to survive on their own. As was also brought up in the book, these kids didn't really have anyone to protect them, or to run home to if or when things got too bad. Anyway, Crooked Kingdom is a pretty well-rounded conclusion to The Dregs duology. On a personal level, I absolutely loved it. But that doesn't mean that there weren't a few things in the book that didn't work for me. I could readily ignore said issues, but I really couldn't bring myself to do as such. 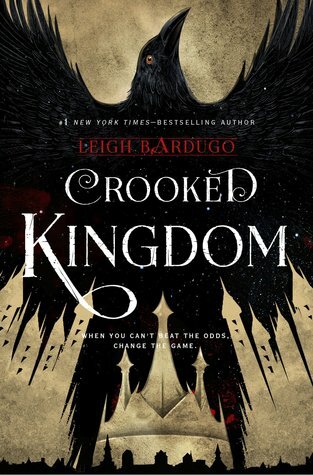 So overall, while Crooked Kingdom was pretty awesome, I think I still preferred Six of Crows more... especially after you realize that Kaz is really a super-powered, all-knowing God in this one--that was a little harder to follow. As a series, The Dregs, I feel, is definitely a step up from The Grisha trilogy.